From The New Criterion. November 30, 2012. A couple of years ago, I bought a Dell computer. Almost every day since then, I have received one or more spam e-mails from Dell offering to sell me something else. As I write, the latest one is headed: "We have unreal deals. You only have three business days." Why should Dell think I would be interested in an unreal deal? There used to be a saying that somebody or something was "the real deal." Now should we say instead "the unreal deal"? And if, as I suspect, "unreal" is just an ironic superlative — so good that it seems unreal, or too good to be true — what then becomes of St. Anselm’s Ontological Proof of the existence of God, which holds that no Being with the attributes of God could exist without also having the attribute of reality? Maybe, on the contrary, God is all the more perfect for not being real, or not seeming so. But then it wasn’t long ago that a learned man told me Anselm had never proposed the Ontological Proof in the first place, so I guess that all such speculation is pretty unreal too. Most examples of simple irony, such as the alleged use of "bad" to mean good in youthful slang are easy enough to sort out. I don’t think I have ever heard it used so in the wild, as it were, but if I did I would expect the context to make it clear whether "bad" meant bad or good. I’m not so sure about "unreal." That may be an example of double or ironic irony. "Unreal," that is, may ostensibly mean "real" but it also may actually mean unreal. The ambiguity is a useful one in a media environment rife with aggressive and tendentious use of these words in an effort to gain political advantage. Our side, needless to say, is always the one belonging to "the reality-based community" — a phrase used by the media’s more vocal critics of the George W. Bush administration to describe themselves — while the other side, as we insist with increasing vehemence, must be strangers to reality. Since I wrote last month in this space about "lies", "lying" and, especially, the growing numbers of accusations of same (see "Lexicographic lies" in The New Criterion of October, 2012), the question has become more urgent as the ever-more bitter partisan division of the election campaign has resulted in both sides making, or being tempted to make, the charge of lying against each other. Such accusations were also a part of the 2004 campaign, but they were mostly left to surrogates to make. Both President Bush and Senator Kerry were more circumspect than some of their supporters, and the former hardly bothered to defend himself against the charge of lying, among other scurrilities, perhaps to avoid giving it greater currency. As I write, such circumspection shows signs of wearing thin in the current campaign, if not of disappearing altogether. Thus, President Obama attempted to explain his poor performance in the first debate by simultaneously accusing Mitt Romney of uttering untruths and taking credit for not doing so. "I think it’s fair to say I was just too polite," he told journalists, "because, you know, it’s hard to sometimes just keep on saying, ‘and what you’re saying isn’t true.’ It gets repetitive." The "it" in that last sentence, if I understand it correctly, refers to telling someone, in this case Mr Romney, that "what you’re saying isn’t true" — which falls just short of calling him a liar, as many of the President’s less polite defenders did not scruple to do. One such was Kevin Drum of Mother Jones, whom I had occasion to mention last month and who wondered if it mightn’t after all have been politic for Mr Obama himself to have condemned what he took to be his opponent’s lies as such, and at the time they were uttered. The conventional wisdom (wrote Mr Drum) says you can’t do that. It’s too negative and voters don’t like it. Personally, of course, I think it would be fascinating to watch Obama buck that conventional wisdom and flatly accuse Romney of lying. . . But it’s also the kind of pipe dream that only bloggers can indulge in. In reality, no matter how satisfying it might feel, the conventional wisdom is probably right. It would hurt Obama, not help him. Why? Because one of the weird aspects of American politics is that voters, no matter how cynical they claim to be, basically accept politicians at their word when they make concrete promises. Romney says he won’t raise middle class taxes? Then he won’t. Romney says his plan won’t increase the deficit? Then it won’t. The fact that it might be mathematically impossible doesn’t seem to carry any weight. It’s all just confusing numbers, after all. What matters is whether you think Mitt Romney would look you in the eye and tell a bald lie. Most people don’t, and unless you’ve literally got a secret video with smoking gun evidence proving otherwise, they consider accusations of lying to be playground level mudslinging. Maybe that’s weird. Maybe that’s unfair. But it’s reality, and it’s a pretty good deal for Mitt Romney. That last sentence provides a good example of the way in which lots of people now use the word "reality" — as if they can take it for granted and, more importantly, can expect their audience to take it for granted that it means no more, can mean no more, than what they think. As we all increasingly find ourselves writing for people who think more or less as we do, I suppose it becomes ever easier to make such an elision. In the same way, "the fact that it might be mathematically impossible" is treated by Mr Drum as if it meant that it is mathematically impossible — which, by the way, Joe Biden loudly and repeatedly insisted it was in the vice-presidential debate the following week. Why should his or Kevin Drum’s belief that Mr Romney’s tax plan is mathematically impossible carry any weight unless they believe their belief to be tantamount to reality just because they believe it? They may or may not show their work, though neither Mr Drum nor Mr Biden did, but either way they expect their readers to accept their mathematics as infallible — and most of them, probably, do. What I think is that people dislike politicians who accuse each other of lying not because they accept them at their word but because they don’t. They expect politicians to lie, and it is an expectation in which the media encourage them. That’s why their "Fact-checkers" can make light of the politicians’ actually or supposedly lying by rating them on a scale of "Pinocchios" or "Pants on fire" — an implicit recognition that a licensed deception is all part of the infantile game they themselves, along with the rest of the media, have done so much to make of our politics. And if the political game presupposes that its players will say untrue things, to complain that the things they say are untrue is not to play the game. Or, more precisely, to make such complaint in the morally fraught language of "lies" and "lying" must seem unfair and hypocritical, at least if you start from the assumption, as I think people generally do these days, that both sides may be expected to be equally cavalier with the truth. The expectation extends to the whole media environment. Dell’s advertising its "unreal deals" in an e-mail is echoed in a humorous radio commercial for Advance Auto Parts, which claims that their latest deal on oil changes is "ridiculous." This may well be an extension of the time-honored advertising ploy by which a merchant pretends to be "crazy" or "insane," so great are the deals he is offering and so much against his own interest. Except that he doesn’t really expect us to think that. He knows we know it’s a joke. "Crazy" and "insane," as well as "ridiculous," have become words of approbation in the vernacular, along with "outrageous" and "wicked." All are examples of simple irony that can function as a double irony when the speaker wants, as a tactical matter, to preserve a certain ambiguity about his attitude to his subject, or to make a joke about it. The selling is done by the joke, not by what may or may not have been said about the product. In other words, what is "ridiculous" about the price of an oil change from Advance Auto Parts is not its lowness but the implied claim that its lowness is so remarkable as to be (ironically) "ridiculous." The advertiser assumes we are in on the joke and will automatically gather from the context that he is being ironic and self-deprecating about his own formal irony. The trick is the same when used by a Ford dealer advertising that his "certified pre-owned" cars are "not just pre-owned, but pre-adored, pre-worshiped and pre-babied by their owners." He thus plays up to and makes fun of the used car dealer’s reputation for untrustworthiness. Knowing that we know nobody can really have worshiped or adored the cars he is trying to sell us, he also knows that we expect and are rather amused by such hyperbolical language from a car dealer. It’s so much what we expect of car dealers — and, increasingly, from politicians. Both may hope to endear themselves to us by simultaneously acknowledging and ridiculing the stereotype. The automatic assumption of dishonesty in our political class, however, has a baleful influence on our politics. Even in the debates, the one forum where the candidates might be expected to speak to us and to each other without the mediation of the media and their own "spin" merchants, the expectation has never been lower that substantive matters ever will or ever could outweigh the sorts of superficialities that are important to the media. Which candidate is more likeable? Which would you rather have a beer — or, in Mr Romney’s case, a glass of chocolate milk — with? Which looks more "presidential" or "in command"? Which looks as if he has something to hide? Such matters in the media context cannot help seeming more important than that of which candidate is more likely to do anything about our ruinous levels of public debt or unsustainable entitlements. The politicians themselves hardly expect that their obsession with superficialities during the campaign will have anything to do with the serious business of governing after it. There was a wonderful irony about the report that, according to The New York Times’s explanation of the President’s debate performance, "Mr Obama does not like debates to begin with, aides have long said, viewing them as media-driven gamesmanship." And so they are, too, but it sounds rather an odd complaint coming from someone who owes his political career — as, increasingly, all politicians do — to media-driven gamesmanship. Perhaps this is just the one form of it he’s not particularly good at. But the possibility would be too frightening to contemplate that he supposes the sorts of campaigning he is good at are somehow not media-driven gamesmanship. The media themselves must know that they are. They may recognize that there is a conversation to be had about the important matters of public policy that will determine our security, our prosperity, our well-being, but they certainly don’t expect it to take place during an election campaign. 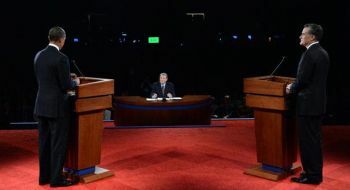 The debates, like everything else, constantly get in the way of that conversation by diverting it into trivialities and irrelevancies and attempts to delight the media with hints of scandal in the other fellow’s background or scandalous negligence, like Mr Biden’s "mathematical impossibility," in the formulation of his proposals. Such diversions obviously best serve the purposes of the candidate whose substantive positions, where he has any, are weaker, but the media would probably pursue them anyway — except in a case like that of the would-be gaffe of President Obama’s open mike assurance to Dmitri Medvedev that "after my election I have more flexibility." Even there, however, the slip didn’t make much impression at least partly because nobody expected him to be frank about his intentions in the first place. Everybody assumes that what is said for electioneering purposes will have little or nothing to do with what is actually done by the winner after his election. Thus, too, Walter Pincus of The Washington Post wrote of the very serious matter of sequestration as if he took it for granted that nothing could be done about it before the election. He quoted the former Defense Secretary Robert Gates as saying: "My hope is that following the presidential election, whatever adults remain in the two political parties will make the compromises necessary to put this country back in order." It was his hope too. It’s everybody’s hope. But the unstated assumption is that it is futile to hope that anything of the sort could happen any sooner — during the period, say, when voters might actually be asked to approve or disapprove of their efforts. Such efforts must simply be suspended for the duration of the election season when the "adults," with their adult concerns about such real real matters as debt and insolvency and the prudent arrangement of budgetary priorities, are expected to go into hiding in order to leave the field clear for the children to get on with their "reality" games. These, it ought to be clear by now, are not quite the same as what Michael Scherer of the magazine Time calls the "battle over the very nature of reality" that he sees as engaging the candidates in this election. Both of the men now running for the presidency claim that their opponent has a weak grasp of the facts and a demonstrated willingness to mislead voters. Both profess an abiding personal commitment to honesty and fair play. And both run campaigns that have repeatedly and willfully played the American people for fools, though their respective violations vary in scope and severity. The rules for this back-and-forth were set in 1796, in the nation’s first contested presidential election, when John Adams’ supporters falsely charged Thomas Jefferson with atheism and loyalty to France while Jefferson’s forces made up fables about Adams’ monarchist ambitions. In the centuries since, campaigns have evolved into elaborate games of cops and robbers. Candidates and their supporters bend, twist and fabricate facts as much as they can without sparking a backlash. Reporters and opposing politicians do their best to run down the deceptions for voters. Mr Scherer is being no more controversial than Time generally is, and he expresses what is now probably the consensus view, certainly among the media and probably among the general public as well — with the aim of reassuring us that things are just the same as they always were. He appeals to people’s expectations that politicians have always lied and always will lie and that it would be foolish to expect anything better of them. Romney advanced a series of principles and policies in the debate, and rather than argue that these are bad for the country, the Democrats are basically arguing that Romney’s ideas are too good to be true — so good, moderate, and sensible that they couldn’t really be Mitt Romney’s, and therefore that Romney is not telling the truth about his agenda. These charges of dishonesty aren’t just false (though they are false), they’re also downright strange. A Republican candidate stands before 60 million voters and commits to an agenda and his opponent responds that this isn’t really his agenda, and that voters should instead look to Democratic attack ads and liberal think-tank papers to learn what the Republican is proposing. That’s the strategy? It sounds improbable when you put it like that — unreal, you might almost say — but once the expectation has been established with the help of the media that what you see is never going to be what you get and that all politicians dissemble, must be expected to dissemble and, therefore, can hardly be blamed for dissembling, it might just about be possible to pull it off. Yet it is not true that things are as they always have been. The difference today is that we’re desperately short of those without an agenda of their own who are willing to "run down the deceptions for voters." What Mr Scherer calls a "battle over the very nature of reality" can only be fought when any possible common ground on which truth can be sorted from falsehood has been eliminated. Or, to put it another way, the increasing tribalism of our politics which I mentioned in this connection last month now extends to the tribe of the media, which have become in effect the third party in this election — a party in coalition with the Democrats, to be sure, but one which retains its own interests and agenda distinct from those of the other two. Those who once stood, or at least claimed to stand, for non-partisan reality now implicitly acknowledge that there is no such thing — though by not being explicit about it and pretending still to believe in a real, non-tribal reality with which they are, uniquely, in touch, they hope to advance their own cause as well as that of their Democratic allies.